Data this week has been surprisingly weak and the anecdotal information from a variety of sources is bordering on stunning. The preliminary GDP data yesterday showed the economy grew 1.8% in the first quarter. This growth is well below our long-term average of 3.1% and is very weak relative to historical recoveries. Expansion of inventories added 0.9% of the GDP so if you were to exclude the inventory build up we'd be talking about the fact that economy barely grew at all in the first quarter. Consider that the Fed has basically cut interest rates to nothing, primed the pump with QE1, QE lite and QE2, and the government is spending $1.5 trillion more than it takes in to spur growth, but the result is a pathetic 1.8% growth rate. What happens to our economy when (if) the Fed stops intervening and/or government spending is cut? This may seem like a harsh analogy but I think it is an apt analogy: our economy is like an 88 year old cancer patient that was just involved in a 2 car head on collision. We're propping this patient up with every medicine known to mankind to prep him for hip surgery and to repair 3 broken bones in his arm when the sad painful truth is that we should probably just accept the inevitable and move on. Our economy is staggering again, but in today's continuous election cycle you can't allow for painful 10 year plans that just might right our ship. Politicians have to fix everything yesterday or expect to be voted out of office. That means our answer for every problem is the quickest and easiest solution with no consideration of it's impact on the future. * Wal-mart - "Wal-Mart's core shoppers are running out of money much faster than a year ago due to rising gasoline prices, and the retail giant is worried. "We're seeing core consumers under a lot of pressure," Duke said at an event in New York. "There's no doubt that rising fuel prices are having an impact." * McDonald's - Offered to hire 50,000 people. They got 1,000,000 applicants for part-time, minimum wage work. * "Roughly one million people were unable to find work after exhausting their unemployment benefits over the past year, new data released Thursday by the Labor Department suggests. About 8.2 million idled workers were receiving unemployment benefits as of the week ended April 9, the Labor Department said in its weekly jobless claims report. That compares to about 10.5 million individuals at the same time last year, a decline of roughly 2.3 million people. Since the federal government estimates that the economy created 1.3 million jobs during the 12 months ended in March, economists said that slightly less people probably fell through the cracks and couldn’t find employment. “That leaves, roughly speaking, about one million people who have exhausted their unemployment benefits and have very likely not yet found a job,” said Joshua Shapiro, chief U.S. economist at MFR Inc. in New York. * Japan has completely fallen off the radar of most Americans because we have much more pressing issues to deal with like what color hat the Queen is wearing today (side note: didn't we fight a war to get away from all of this royal garbage? I blame Disney and their princesses for undoing 200 years of fighting for the concept of a Republic). However, there is a real economic impact from the earthquake and it is going to be with us for some time. Panasonic announced a major restructuring that is going to reduce their headcount by 30-40,000 people but they also cited supply disruptions caused by the earthquake that impacted operations. For the real estate hounds consider David Tepper's latest plans in the Hampton's. 3) File plans to tear down the $44 million Hampton's mansion and replace it with one TWICE it's size. 4) Sit back and enjoy as the peasants scoff at your plans. It's worth clicking through to see the pics of the house that he's tearing down. My main reaction to the article was "What is he doing living in Livingston, NJ?" Livingston is kind of the ugly step child of the nice suburban NJ train towns. It's full of McMansions and Soprano wannabes so it doesn't really feel like the sort of town where a master of the financial universe would live. "A record 18.3% of the nation's total personal income was a payment from the government for Social Security, Medicare, food stamps, unemployment benefits and other programs in 2010. Wages accounted for the lowest share of income — 51.0% — since the government began keeping track in 1929." Usually, when everyone has the same opinion the market tends to throw us for a loop but right now it's all green, all the time. I came across a really nice chart in the Miami Herald of all places last week. It speaks to the theme that I've highlighted before. The government views all jobs as the same. A job added at McDonald's offsets a job lost Boeing. Obviously, this is ridiculous but that's the way the government views the world. The Miami Herald took a look at the sectors adding jobs over the last month in South Florida and their average weekly earnings and compared it to the sectors losing jobs and their average weekly earnings. It's a pretty compelling picture of the US economy. Restaurants, General Merchandise Stores (Walmart), Food Stores, Retail, and Office Support. The average weekly wage of these sectors was about $450 per week. Good luck living in South Florida on that wage. Healthcare, Hospitals and Local governments also added a significant number of jobs and their salaries were much higher (averaging around $1,000 per week), but these jobs are largely due to government stimulus and escalating Medicare/Medicaid payments that are in the cross hairs of budget cutters. Those jobs are definitely at risk over the next 5 years. Finally we get to the industries cutting jobs in the past month in South Florida - Construction, Manufacturing (avg salary about $950/week), Banking, Wholesale, Finance, Insurance, Professional Services, Information Technology and the Federal Government (avg salary about $1,250/week) and finally management with an average salary of about $2,000/week. Step back and look at that for a second. We're adding jobs at McDonald's, Walmart, hospitals (think there is a connection there as we eat ourselves into an early grave with food from Walmart, McDonald's?) while losing management, technology, finance, banking, construction, and manufacturing jobs. Anyone that sees a great future in that set of data is either being dishonest or is not very bright. In total, the Herald found that about 8,700 jobs had been created with which added about $3.4 million of net payroll to the economy meaning the average wage of the new jobs was below $400 per week. But the stock market is flying so don't tell Timmy Geithner and the Ben Bernanke that they have no clothes or it all might fall apart. Interesting time to be traveling but I'll be out of pocket the balance of the week. The S&P move today shook the US markets but it's been coming for some time now and I'm surprised that anyone was surprised by the news. Greece/Portugal may be the story of the day later this week (the bond markets are signaling some pretty rough times). Hmmm, this could get really ugly up here in NNY if there was a sudden turnover of the population or a sharp increase in unemployment considering the huge shadow inventory that S&P is reporting. 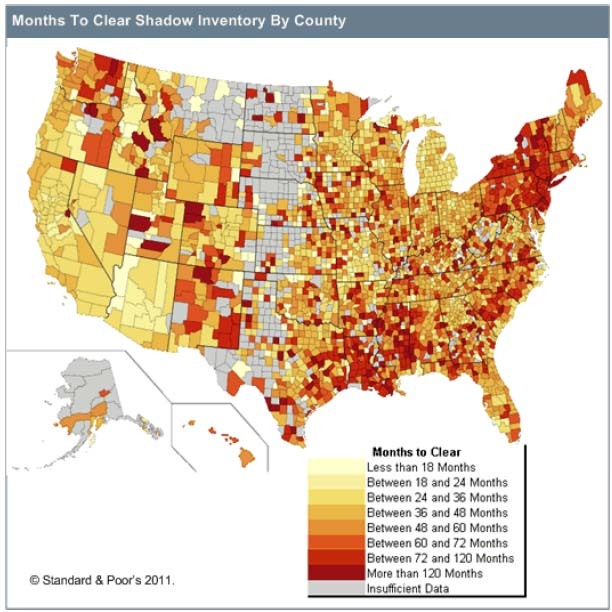 Note that according to this chart it would take over 10 YEARS to clear the shadow inventory of housing (shadow inventory is defined as mortgages that are delinquent or in foreclosure but yet to hit the market). This is probably due in part to the small number of homes sold out of foreclosure in Jefferson County every year, but it is something to be wary of. Also note that the area around the greater NYC region looks pretty ugly. What's in the water in Illinois? In the race to claim the title of "Most Dysfunctional State" Illinois seems to be opening up a nice lead over NJ, NY and California. "State government is an employer, too, with approaching 70,000 full- and part-time workers. And from that pool there are currently 25,000 open workers' comp claims. That's a breathtaking number. It is impossible to believe all of those are legitimate. Apparently federal investigators have questions, too, as they've launched a criminal probe following reports by the Belleville News-Democrat of alleged abuses of the system at Menard Correctional Center in Chester, where more than half the staff - 389 people, most of them prison guards and including the warden - have been paid some $10 million for on-the-job injuries such as those occasioned by locking and unlocking cell doors." 35% of all state employees are on workers' comp? Either their work is way too dangerous or to paraphrase Shakespeare "Something is rotten in the state of Illinois." 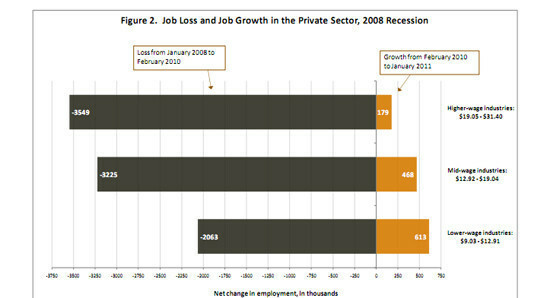 The top bar are "HIGH WAGE INDUSTRIES" and it shows that the bulk of job losses have occurred in this category. The bottom bar is "LOW WAGE INDUSTRIES" and it shows that the bulk of the job growth has occurred in these industries. This story really didn't get as much traction as I thought it would. Please try not to drink any beverages when you go forward to read this article or you may fry your laptop. "A budget compromise that was touted as cutting $38.5 billion from the 2011 federal budget would actually only cut $352 million in expected spending during this fiscal year, according to a Congressional Budget Office analysis--news that is stirring conservative anger in the hours before a key vote." I hate being right on this issue, but I think me exact words to my mother last week were "both sides will fight back and forth until they reach a last minute compromise and then nothing will change". On a related matter the Nuclear and Industrial Safety Agency has increased the Fukishima disaster to a LEVEL 7 disaster. This is on a scale from 1 to 7 with Chernobyl being a 7. All is well, nothing to see here. The study found cesium-137 at levels between about 590,000 and 2.19 million becquerels per cubic meter." Comparing this to Chernobyl: "After the Chernobyl nuclear accident in the former Soviet Union in 1986, residents who lived in areas where cesium-137 levels exceeded 555,000 becquerels were forced to move elsewhere. The amounts of cesium-137 found in Iitate were at most four times the figure from Chernobyl." Alcoa kicked off earnings season with a slight miss on sales, earnings were a little better than expected and lighter than expected capital expenditures. The stock was down about 4% at last check. While you were racing from one end of town to the other to avoid paying $3.99/gallon for regular gas, the powers that be in Washington compromised on "massive" cuts totaling $38.5 billion and the Republic has been saved. Sarcasm off. Here's all you need to know about the Federal Gov't in 2011. Cut everything and defense and we just about break even. If interest rates jump 1/4 of 1 percent the cost to the Federal Gov't will almost equal the total cuts just announced. If rates jump a 1 percent we'll be $100 billion in the hole. Oil is around $113 for West Texas Intermediate (nearly $130 for Brent crude) so gas is heading toward $3.99/gallon locally. Talk of a settlement in Libya might calm the oil markets for a moment or two tomorrow, but physical metals are still spiking so there may not be any relief in sight for some time (although, I heard an expert this morning assure me repeatedly that there is no inflation in the US). I don't normally offer endorsements of products or services, but given the spike in gas prices it might be worth looking at the Pen Federal Credit Card. This is a Federal credit union that you can join if you work for the military or have a relative working for the military. I wanted to test out the card for a few months to make sure it works as promised and so far, so good. Basically, if you charge gas purchases at the pump they credit your account for 5% of the total cost of gas purchases in a month. Buy $100 in gas in a month and you'll get $5 back. Basically, it's like $0.20 off per gallon with prices approaching $4/gallon. Ah, good old American quality - Steering Wheel Falls Off a Chevy Cruze Japan looking to extend their evacuation zone around Fukushima. How long before we see Blinky the three eye fish? While the world's attention has drifted away from Japan and on to the more cable news ready conflicts in Libya and The Ivory Coast the news in Japan continues to get worse. Remember a couple of weeks ago when the world went nuts with the "radiation levels seen at a million times higher than normal" story? That was quickly put to bed as single bad reading. Nothing to see here move along. "The unstoppable radioactive discharge into the Pacific has prompted experts to sound the alarm, as cesium, which has a much longer half-life than iodine, is expected to concentrate in the upper food chain. The amount of iodine-131 dropped to 79,000 becquerels per sq. centimeter Sunday but shot up again Monday to 200,000 becquerels, 5 million times the permissible amount. "All of Japan's sea products will probably be labeled unsafe and other nations will blame Japan if radiation is detected in their marine products," Yamamoto said. Tepco on Monday began the release into the sea of 11,500 tons of low-level radioactive water to make room to store high-level radiation-polluted water in the No. 2 turbine building. The discharge continued Tuesday. While the levels of iodine are startling it's relatively short half life means it's not going to be a huge issue. However, the cessium numbers are very troubling and these readings are all from Saturday, before Tepco started pumping another 2 million pounds of radioactive water into the sea. The amount of disinformation coming from Tepco and the Japanese government is very disappointing. So far Apple is holding up remarkably well considering that it's weighting in the major Nasdaq indexes was cut. Since 694 index funds have Apple as their top holding this could eventually lead to a bit of selling pressure for the biggest of the big momentum stocks but so far so good. This report is real heavy lifting but it's worth the effort. Mary Meeker (a former competitor of yours truly) and other put together a compelling piece of research on the future of the US by analyzing the country as if it were a company. It's a troubling look at our future. One of my favorite data points: By 2025 (just 14 years away) entitlements plus interest will absorb all of the Federal gov't revenues. That will leave nothing for defense, education, infrastructure or anything else. As I said, this report is 200+ pages so load up on the coffee before tackling this one. T-14 and counting. Professional & Business services led the surge with big additions in temporary help (we're all temporary workers now) and business services. Our old favorite, the Birth/Death model kicked in an extra 117k jobs to the black box. One of the better pieces of work I read this morning pointed out what I've been saying for years. All jobs are not created equal. In the late 90's when low-end tech jobs started to move overseas they were replaced with finance, mortgage bankers and real estate agents. Today's new jobs seem to be concentrated in temporary help, retail and leisure/hospitality. These are historically low paying jobs. So when a software sales rep takes a job as a Walmart greeter that person has added 1 job to the economy. It's a wash right? Unfortunately, it will take 15 Walmart greeter salaries to equal their old pay scale. This is evidenced by the falling rate of Social Security taxes paid into the government in Q1. We're down almost 5% in collections as the number of employed persons continues to climb (I know the payroll tax holiday accounts for some of that decline but not all of it). So, maybe more people are employed but we are earning less than we did as a nation last year while everything around us costs 20% more (gas, food, heating). That's not a great long-term trend but these headlines will work wonders for a re-election campaign. Still sifting through the data, but 216k jobs is above expectations. Some things reported seem a little fishy (jobs are going up but people out of work are looking for new jobs? ), and the avg. hourly wage and avg hours worked seems the same, but on balance it's better than a sharp stick in the eye.